Who are my influencers? How can they help me amplify my message? These are common questions among those taking the plunge into influence(r) marketing. As I said in my previous post, influencers have the ability to help brands connect with their audience. In your content marketing strategies, they can help you create compelling content, and deliver it to the right people. Content marketing goes hand in hand with influencer strategy, as explained by Hubspot and Traackr in our new guide. While influencer strategy for content marketing sounds fabulous, the finance industry in particular presents a challenge for content marketers. In most cases, the industry is highly regulated, and the sales process can be complex. But according to research, the financial industry is seeing an increasing level of demand for online engagement. How can influencers help in this heavily regulated environment, where compliance is key? Fidelity listens to what’s trending among their influencers to adapt their content strategy. Paying attention to trending content helps them identify what their audience wants to learn about. 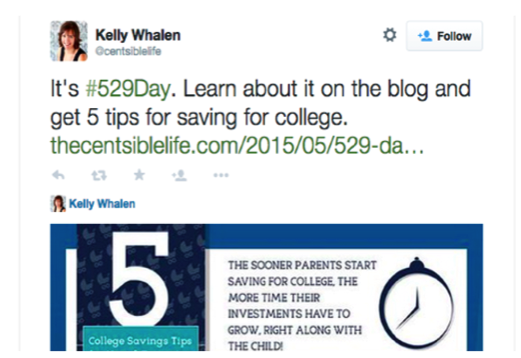 Fidelity then works with influential bloggers, such as The Centsible Life, to create content that is valuable to customers. What Fidelity does well, is find the right influencers to tell a compelling story and differentiate their content offering. Through their content marketing and influencer strategies, they are able to work with what they can say, rather than what they can’t. The first step to building influencer strategies is discovering your influencers. The first step to reach your customers’ conversation is to find the Top Influencers.